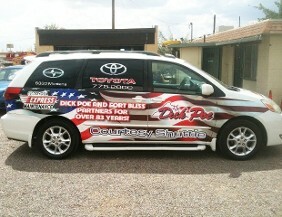 Get your car looking new and stylish with vehicle wraps from West End Graphix LLC in El Paso, Texas. Whether you need wraps for advertisement or personal purposes, we have the talent and resources to suit your needs. Decorate your vehicle with wraps that are away from the norm and custom-tailored to you. We consult with you on ideas to ensure that you get the exact decal you imagined. Additionally, we use 3M™ materials, which make for a longer and more durable performance. We take care of every little step from laminating the print to the actual installation of the wrap itself. Prices for wrapping on cars and small SUVs range from $2000 to $3000, and larger SUVs and vans range from $3000 to $5000. Contact us when you need high-quality, customized vehicle wraps to adorn your car.